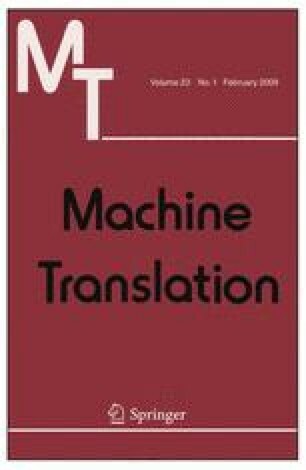 The last few years have witnessed an increasing interest in hybridizing surface-based statistical approaches and rule-based symbolic approaches to machine translation (MT). Much of that work is focused on extending statistical MT systems with symbolic knowledge and components. In the brand of hybridization discussed here, we go in the opposite direction: adding statistical bilingual components to a symbolic system. Our base system is Generation-heavy machine translation (GHMT), a primarily symbolic asymmetrical approach that addresses the issue of Interlingual MT resource poverty in source-poor/target-rich language pairs by exploiting symbolic and statistical target-language resources. GHMT’s statistical components are limited to target-language models, which arguably makes it a simple form of a hybrid system. We extend the hybrid nature of GHMT by adding statistical bilingual components. We also describe the details of retargeting it to Arabic–English MT. The morphological richness of Arabic brings several challenges to the hybridization task. We conduct an extensive evaluation of multiple system variants. Our evaluation shows that this new variant of GHMT—a primarily symbolic system extended with monolingual and bilingual statistical components—has a higher degree of grammaticality than a phrase-based statistical MT system, where grammaticality is measured in terms of correct verb-argument realization and long-distance dependency translation. This work has been supported, in part, by Army Research Lab Cooperative Agreement DAAD190320020, NSF CISE Research Infrastructure Award EIA0130422, Office of Naval Research MURI Contract FCPO.810548265, DoD Contract MDA904-96-C-1250, ONR MURI Contract FCPO.810548265, Mitre Contract 010418-7712, the GALE program of the Defense Advanced Research Projects Agency, Contracts No. HR0011-06-2-0001 and HR0011-06-C-0023, and the Human Language Technology Center of Excellence. Any opinions, findings, conclusions or recommendations expressed in this article are those of the authors and do not necessarily reflect the views of the sponsors. We would like to thank Necip Fazil Ayan and Nitin Madnani for help with some of the experiments done. We would like thank Kishore Papineni for providing us with the confidence interval computation code. We would like to thank Owen Rambow, Srinivas Bangalore and Alexis Nasr for providing us with their MICA parser. We would also like to thank Amy Weinberg for helpful conversations.